Register Log In GliderCENTRAL Forums Diet & Nutrition I'm new with a couple joeys in the sack. So I got a pair of standard gliders and the owners were a young couple of girls that thought they were 1-1.5yo but never had joeys since they had them and they had ferrets that killed the other male (brother to current male). They were obviously much younger and small. The set is bonded and I've named the male Kalili and the female Lutana which are both Aboriginal names meaning moon. I've read just about every resource I've found. I've had exotic pets before and have the USDA list of foods and read just about every argument about grapes and everything in between. Here is my question. My female is very pregnant and very bowlegged. She barely gets out of the pouch anymore, but was getting out a lot more regularly to eat durig the day when I first noticed her preggo. I manually feed hear some calcium worms daily but worry as I haven't seen her drinking at all. I've taken to taking the preferred pouch and putting it right next to the fruit and she does eat but drags it by the opening to the pouch to eat. Am I doing something wrong? I mean I don't want to worry this much but I don't see her eating or drinking from the bottle. It is extremely unusual for a female not to leave the pouch when carrying joeys regardless of how big she gets. She will still leave to eat, poop/pee and play unless there is some other reason. Have you been able to physically remove her from the pouch to get a good look at her in order to determine if she might be sick or if you can actually see her joeys? How is the male, Kalili acting towards his mate Lutana. Normally he would be very attentive to her. The above portion of your post is what concerns me the most. First because she should be coming out of the pouch by herself to eat as I have already mentioned and second because of what is being offered to her. Is this all they are being offered? What about their main source of calcium? If this is what they are eating, then it is possible she cannot walk, and I would strongly urge a vet visit for her. They also need to have a balanced diet with a staple along with veggies and fruits. She can walk just fine. She can come out on her own and who knows she might be out all the time as I sleep. And if I take her out she can easily jump and climb back up to the pouch. The diet I offer is fine and she looks perfectly healthy. I'm assuming you are trying to be helpful but it doesn't sound like you read the post or understood my question. Is it more common for the female to become more sneaky and avoid coming out when I'm around? The same amount of food is missing every morning and I doubt the male is stress eating. My assumption is she is just coming out more while I sleep because she being protective but didn't want to taint the conversation with my thoughts. I am sorry you took my response the way you did, however, I did read you original post several times before replying because I wanted to make sure I did understand it. You did say the following: "She barely gets out of the pouch anymore, but was getting out a lot more regularly to eat durig the day when I first noticed her preggo." Followed by:"I manually feed hear some calcium worms daily but worry as I haven't seen her drinking at all. I've taken to taking the preferred pouch and putting it right next to the fruit and she does eat but drags it by the opening to the pouch to eat." I did not see where you asked about her being more sneaky about coming out when you are around At any rate, if you are bonded to these gliders, then it should make no difference at all to her if you are around when she comes out just because she is carrying joeys. As for my asking about the diet you are feeding, we always ask this question in case owners are not aware of the dietary needs of these animals. Just because they are exotics does not mean their needs are the same as all exotics. They are not. You cannot simply go by a list of foods from the USDA. We are always simply trying to help. I do my research and appreciate feedback. Darkmornings, thanks for your thoughts on the subject. I just thought the behavior was odd which is why I asked the question. What diet are you feeding? Are you giving them an extra serving of food. If they are a pair you should be providing them enough food for three gliders, she is producing milk. My girls usually are in the pouch in the evenings and I see the daddys out. But once the joeys are officially OOP it flip flops and I see the mommas out and daddy is joey sitting. Those mommas do walk funny when they are stingy and keep stuffing two big joeys back into her pouch. Could you take a video of her walking and post a link here so I can see how she is walking. Well, I'm a little less worried now as I've sen Lutana out a bit more at night. Both of them seem to not be coming out during the day. Which they used to get a snack here and there. But during the day I hear her singing a lot. You can see a week old video on YouTube under blackandbluejeep (I'll be changing the handle as I've sold the jeep). I can also take more recordings as she does it a few times a day for minutes on hand. I set out the fresh fruit/greens at about 10pm and leave it for the evening so they can have whatever they want for a few hours and there is always something for them to get thru toys and such to encourage foraging. I am not going to talk about what I feed because that is a hot button for so much of the glider community as I read. I'll say the ca:p is proper (extra ca right now in the form of Glider Cal from Exotic Nutrition) and other then the fruit/veg there is also vet recommended blends offered and changed out daily. I also have baby food and marsupial milk on hand for the joeys if needed (the Exotic nutrition Joey kit). I am a little unclear as to when I'll need these supplies and why. I've only manually fed babies if the mother rejected them or the runt in large litter animals. Is this just a precaution or is it common that I need to manually feed them? I find the directions on how to feed them and how long to feed soft foods before solid foods but shouldn't that be a mother feeding her young? Why and when would i have to intervene? On blackandbluejeep channel on YouTube I put 2 videos. The shorter one shows one tail sticking out. The longer one shows the male and other toy he played with. I am very glad you are seeing them more at night.Their sleeping more during the day is very normal, so nothing to worry about there. You are correct in that diet has always been a hot topic for as long as I've been in the glider community and will continue to be. The good news is, through the research the community has been able to fund, there have been strides made so that we now know which diets are better for our gliders, which are lacking and which are simply knock offs. The choice is left to the owners to do the best for their pets. As long as the mother has been given sufficient nutrition so that she can produce enough milk for her joeys, then there should be no reason to supplement or hand feed the joeys. Rejection is rare so relax and let the parents do their jobs. If you use the Use Full Editor feature when posting a reply, there is an icon at the top of the reply to embed your youtube videos or if you like, I could embed them for you. Just a thought. That should embed the links if I have permissions on the forum. The singing was last week but the first 2 were just last night. My apologies. I forgot we lost the actual icon to embed youtube links with the last upgrade. What you posted is perfect. I agree with Karen, diets are a hot topic. But I just want to say this, I would not feed anything from Exotic Nutrition. 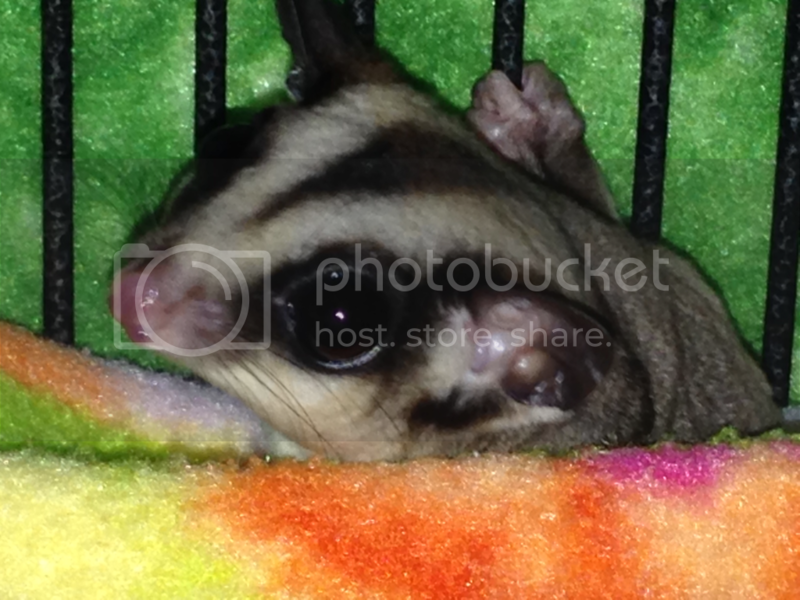 A well respected member of the sugar glider community had the Exotic Nutrition Instant HPW analyzed. They ran the tests twice and both times what was in the bag was not correctly indicated on the bag. Gliders have died on Exotic Nutrition diets. Lets face it that crap in a jar is scarier than a Freddy Krueger movie. Your gliders need a protein in their diet as well as vegetables and fruit. I recommend Critterlove products with the recommended salad mixtures found on her website, or BML. I myself use Critterlove and the recommended salad mixtures, I do rescues and they all do very well on this diet. I had one little old guy come in a month ago, underweight and brown, he has gained weight and he is turning grey again. He just has a little brown fur on his bum right now. He was a hot mess when he came in. In response to the Critterlove sales rep.
Again, I don't want to discuss opinions on diet (and sorry I even put what I did). But here I go! The fact is that most any caring owner is providing them with more nutrition then they would get in the wild. Any omnivorous mammal can survive a lot more then you think. Look at my videos and tell me a wild one looks healthier. I hate to be a jerk but I hate opinion pieces. So, your random member is to be believed more then the scientists that analyzed the product and was scientifically proven to the FDA and the USDA? Plus many vets agreed with the results provided from many scientist's that got thru the government red tape so they could shelve the product? The same nutrition tests you quote are not double blind and most likely the product was tampered with or completely fake to produce the results and promote their own product. I mean, I'm no scientist but really? Last edited by Luckey; 03/30/19 02:08 AM. Last edited by Luckey; 03/30/19 02:10 AM. So, your random member is to be believed more then the scientists that analyzed the product and was scientifically proven to the FDA and the USDA? Plus many vets agreed with the results provided from many scientist's that got thru the government red tape so they could shelve the product? The same nutrition tests you quote are not double blind and most likely the product was tampered with or completely fake to produce the results and promote their own product. I mean, I'm no scientist but really? Everyone has a right to there own opinion. They also have the right to choose what they feel is best for their pet. Your statement here is quite presumptuous. You assume too much without doing your own research. There have been diet studies in an independent laboratory outside of a manufacturer's influence. They had a survey of what diets should be tested in this round. Although EN was requested, it didn't make the cut due to inconsistency in the list of ingredients compared to what was actually in the contents of the container. That's it. Your gliders are beautiful! They look very healthy. Momma is definitely fat with babies! I'm glad she decided to come out and forage. She has clear eyes and very coordinated even with her belly bulk. Are these her first Joey's? I appreciate a good response. They should be her first, as the prev owners thought they were older but got 20g larger since I got them in December. Even then, should I start a new thread that says "No talk about diet"?!?!? For real though... is that so hard? Also, that study is wrong, it's not a double blind study and most likely the "council" of people that commissioned it are biased. I don't even feed the brand I mentioned but have purchased the marsupial kit and I guarantee it will be right. I don't even doubt that brand. KAREN? CAN YOU PLEASE DELETE MY EXISTANCE FROM THIS SITE? Rule 4. GliderCENTRAL is a family oriented board moving towards a "PG" rather than a "G" rating. Be polite, courteous and respectful to other board members at all times. This means illegal substances, illegal activities, flaming, sexually explicit subjects, spamming, harassing, policing, diet bashing, and abusive or negative personal posts are not allowed. Posts and sometimes entire topics that contain such content will be removed, and the poster(s) may be warned, suspended or banned at the discretion of the board administrators. Abuse, flaming or inappropriate comments directed toward GliderCENTRAL, its Moderators and Administrators, or failure to comply with the direction of a Moderator or Administrator, the poster(s) may be warned, suspended or banned at the discretion of the board administrators. Please keep any personal matters off the board. Take it to email or PM. Please keep in mind that board rules do apply when using the PM feature. I am the one that provided the Exotic Nutrition crap Instant HPW to me tested. Sales Rep, huh? Well my gliders have been part of the diet study. Because I have enough gliders to get a decent amount of blood for testing, my gliders have donated to the studies three times. When I first got gliders I fed BML, my gliders barely touched the BML. so I switched to Original HPW, now known as Critterlove Original. When Peggy released Critterlove to the public I switched to that. I didn't like being held hostage by the few people that sell Wombaroo High Protein supplement here in the US. For a while I did order it from Australia myself, until it was no longer less expensive due to the currency exchange. I am not a sales rep, I am a retailer for it now, I have 3 customers. Woopdedooo! I became a retailer so that I could feed my gliders and all the rescues I take in at wholes sale prices. I have attached a pictures of one of the rescues that came in recently. He was brown when he came in, his former diet was The Pet Glider diet. He also smelled to high heaven. I will get better pictures later, but he is now turning back to grey and he has put on some much needed grams. He was way too skinny when he came in. Um........ your own moderator said that the food I mentioned kills gliders. This has got to be a joke. That is not "diet bashing"? I haven't said one negative thing about any specific product. I only mentioned one by name so that someone might know specifically what I have on hand. There is a term that is taught in grade school. It called the "scientific method". If anyone here believes I'm being offensive, that is your feeling and I'm not responsible for that. Read my posts without your insecurities and see that I'm not attacking anyone. The fact that the conversation was moved to "nutrition" when I specifically asked multiple times to not discuss diet is beyond me. ROTFL! Based on one post you made I guesed you were a sales rep and i was right! It's like someone is playing a joke on me. Is this not as obvious to anyone else?!?!?! This has gotten completely out of control by both parties and completely from diet into the personal realm, IMO. Bring it back around, please, so I do not have to lock this thread. Please read our Diet Bashing Sticky found at the top of this forum which, as you can see, has been in force for a very long time, and still holds true today. There is no reason diets cannot be discussed civilly. Thanks Karen. I don't want to be in the personal realm. I prefer to speak about facts and behavior. I know I am curt, but that allows me to usually be short and to the point. I was looking to get a little advice with my first joeys and the conversation was taken well off topic. I did ask multiple times to not speak about it but was redirected multiple times to the subject. This is my fault for falling for that. I'd like to thank you, Lady... and Dark... for input on the actual topic. Thank you, Lucky, for understanding. Last edited by KarenE; 03/30/19 01:40 PM.